Green tea is known for its health benefits from ages. 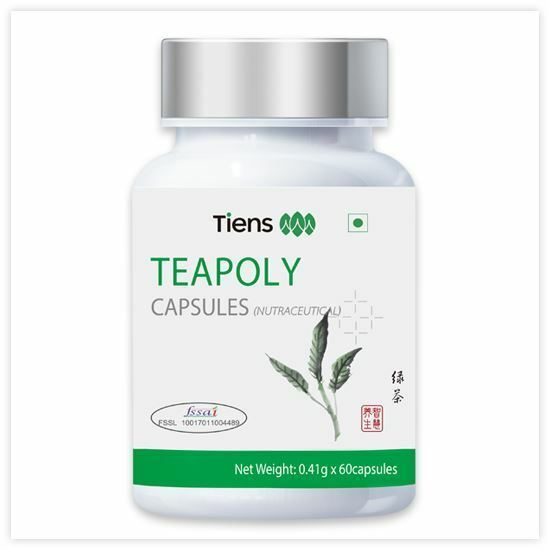 Tiens brings to you the health benefits of green tea in the form of capsules. Cumulative effect of three phytochemicals present in the capsules makes it a best-said antioxidant, acting as a very strong free radical remover/destroyer. There are 20-30% of polyphenol compounds, about 30 types of it present in green tea. These chemicals even have the capacity to destroy cancerous cell. Acts as free radical scavenger. Contains ingredients which are 200 times more powerful than Vitamin E.
Helps in reducing risk of heart diseases. Helps in reducing red blood cell breakdown. Support body against respiratory and digestive infections. Reduces oxidative damage of cells. Delays ageing on long term use. Improves memory, helps in reducing cognitive decline.